If you are looking for a moving company to help you with your move from New York to Philadelphia you need look no further. We are one of the most reliable relocation companies when looking to move from NY to PA. With many years of experience behind and dedicated moving crews for NY City to Philadelphia PA, we have seen a lot. Actually, we have seen (and moved) pretty much everything. And we will continue to do this – not because it’s easy but because we like it. Moving people’s life forward – that’s what we do at Great Nation Van Lines. Philadelphia is an amazing place – it is the economic, cultural and art center of Pennsylvania; a city with a great history and even brighter future - only a hundred miles away from NYC. Philly offers every possible upside of the modern urban life combined with amazing history and beautiful architecture. When you are moving from New York to Philadelphia, you will probably find the city smaller at first but there is so much to see and to do there that soon you will fall in love with it. The neighborhoods in Philadelphia are divided into seven large sections - North, Northwest, Northeast, West, South and Southwest and Center City. Every single one of these sections has its advantages and its own unique vibe. 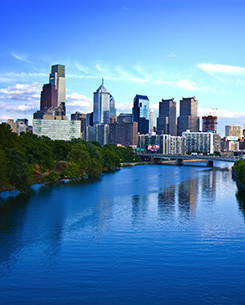 If you’d rather spend your time in Philly doing something pleasant – like a long walk in the streets of Center City or enjoying a supper with your family in one of the world famous Philadelphia’s cheesesteak restaurants than worry about packing, loading and moving your belongings, call Great Nation Van Lines and we will take care of everything you need for the smoothest relocation experience. Why Choose Us For Your Upcoming Move? We get the job done. – It doesn’t matter how hard and demanding your move is we will get it done. We help you avoid stress through the entire process. – You can rely on us to take care of every aspect of your move so you won’t have to worry about packing, finding transport, transportation, loading and unloading the vehicle. We offer comprehensive rates for moving and parking as well. We have moving trucks and crews that are dedicated to this route. We work fast, efficiently and we value your belongings. You receive our top notch services at an irresistible price. What The Cost Of Your Move To Philly Will Be? Great Nation Van Lines offers high quality moving services at the best rates in the region, and we mean it! Simply fill out our FREE cost estimator for a quick and detailed moving estimate. Relocating from New York City to Philadelphia has never been more affordable and reliable – you’ll get the best moving experience for the value. Your smoothest cross-state relocation is just a click away – do not hesitate, submit your details now!